Since Dutch colonial times, the Maluku Islands have been a place that drawn many people’s interest. If back then it was because of the abundance of spice resources that was coveted by many European trade companies, recently the archipelago has become a tourist destination that enthused many travelers, both domestic and international. Kei Islands, Banda Island, Morotai Island, Ora Beach, and many other places in it started to flourish as holiday spot. Even though its fame grows exponentially thanks to its tourism potential, many people still does not know and understand about the variety of culture and language in the archipelago. 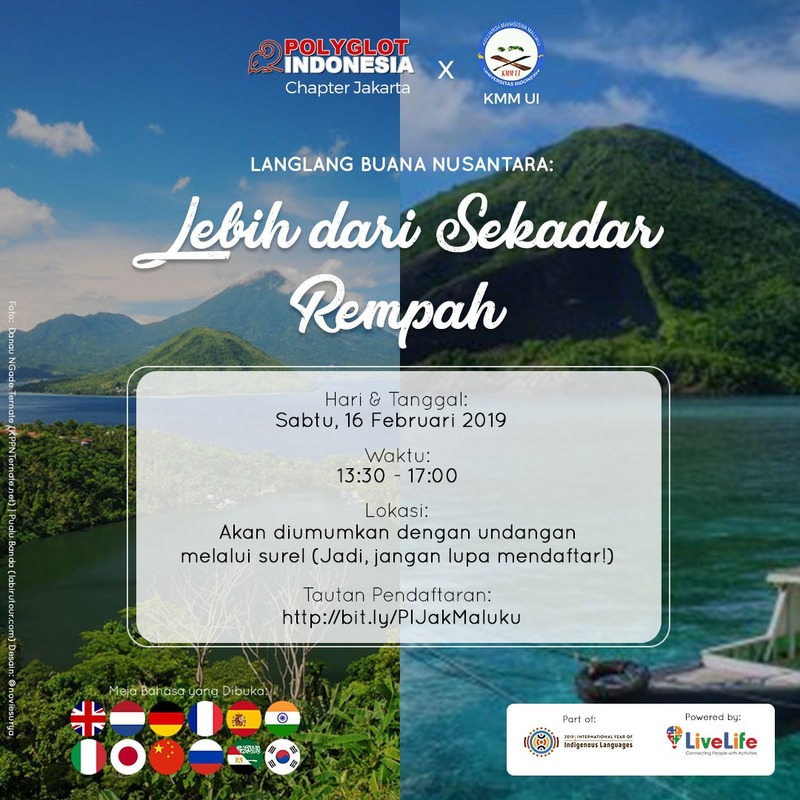 In the third Language Exchange Meetup of Langlang Buana Nusantara series, Polyglot Indonesia Jakarta Chapter collaborated with Keluarga Mahasiswa Maluku UI (KMM UI), a student union of Maluku Province at Indonesia University, to reintroduce what Maluku Islands really is! Our friends from KMM UI will also teach us Ambonese Indonesian! English, Dutch, German, French, Spanish, Italian, Russian, Japanese, Mandarin, Korean, Hindi, and Arabic.